At this time, we're aware of six surviving theremins, two theremin cellos and one rhythmicon that survive from Theremin's Plaza Hotel Annex and his Theremin Studio (37 West 54th Street). At this time, we're aware of one surviving theremin, probably built in Russia before Lev sailed to America. Likewise, a post US-era Soviet theremin, rhythmicon and terpsitone are known to survive. There is evidence of a number of additional instruments of Theremin's making, the whereabouts of which are currently unknown. These include at least three theremins, three keyboard instruments and four theremin cellos. Inevitably additional instruments of various varieties will have been made. Additionally, Theremin Studio paperwork survives that attests to delivery of a custom theremin in 1937. Leon Theremin, Theremin Studio, Teletouch, or Commissioned? The earliest known surviving theremins appear to have been made by Leon Theremin during the first year and a half of his U.S. sojourn, most probably dating from about May 1929. One surviving custom theremin, circa 1933–1934 has Lev's hand-written numbers in it and a Theremin Studio paper label (not Teletouch ), extracted from his standard printed letterhead. A number of Lev's U.S. era theremins bear his hand-written marks, although we have not seen another with this Theremin Studio label. Later theremins to emerge from 37 West (other than those made for Theremin's patron Lucie Rosen, or Clara Rockmore) are considered to be Teletouch instruments. For practical purposes, the Teletouch corporate era began in 1933, although at its formation the company was expressly not envisioned as a musical instrument entity. Rather, its mission was to produce devices such as proximity-controlled alarms and shop window displays. Thus, theremins that were originally delivered with Teletouch papers or other identification would likely date from the mid to late '30s, and are quite rare. While the instruments listed in this Lev-Built section are either confirmed to have, or almost certainly have a direct connection to Leon Theremin as evidenced by handwritten numbers, fabrication methods, and materials, some of these instruments may be the product of studio technicians, employees, or colleagues. Most Lev-built instruments possess various common traits, including one construction technique that we have not seen on any other surviving theremin or any vintage electronics for that matter, whether home-brew , made by a professional custom set-builder, or factory-built. Rather than soldering in a fixed-value, frequency determining capacitor in the oscillator sections, Lev would instead fabricate a special platform consisting of a black Bakelite insulating block with two threaded posts, and two fixed-position solder lugs. This sub-assembly was in turn fastened to the instrument's interior panel, chassis, or wooden bulkhead with two screws. He would then slide a number of mica capacitors onto the platform posts, using nuts to secure them. A specific, early style of mica capacitor was used for this, of a type that was common in the mid-1920s, but essentially obsolete at the time Lev was using them in the late '20s and '30s. This obsolete style of capacitor was flat and manufactured with two rivets, which made them a perfect choice for Lev's universal platform; his platform posts being spaced to perfectly fit through the two factory rivets in each capacitor. The Cornell-Dubilier Micadon is typical of this type of capacitor. An assortment of mica capacitors would be selected for their specific values of capacitance, and stacked in various combinations to facilitate the alignment of the oscillator circuits, thus allowing a convenient way to incrementally arrive at the best result. These capacitor stacks could be easily altered to suit the preferences of the builder and the customer. If an owner wanted to increase the octave range (for example), she could bring her instrument in for recalibration, which could then be accomplished simply by loosening the securing nuts and changing the capacitors in the stack. No soldering required. Most of Theremin's original instruments have at least three of these capacitor stacks, two for the pitch oscillators and one for the volume oscillator. It's also common to see one or more platforms with no capacitors. These may be test terminals or may serve some other purpose. 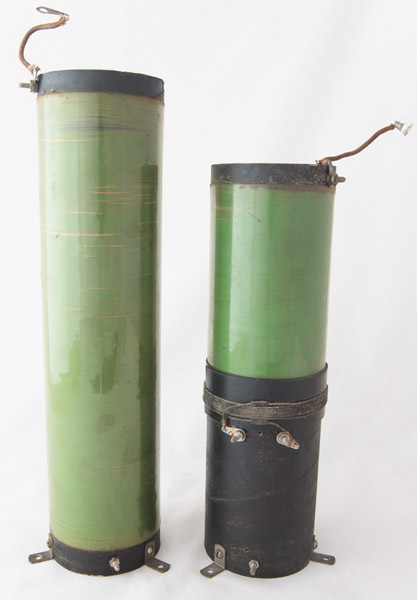 Green silk insulated wire and celluloid protective sleeves on coils. Another signature Theremin touch was that the electrical coils in his instruments were made with green silk or cotton-insulated wire. This appears to be the case in his theremins as well as cellos, and applies to the heavier gauge windings as well as the extremely fine windings such as found on his resonance coils. Green cloth insulated wire was not uncommon in its day. It was used by hundreds of radio manufacturers and sold in spools through various parts suppliers in the 1920s. However, similar to Lev's use of the older style capacitors, he continued to use the green wire long after the electronic industry drifted away from that color (cream or beige silk insulated wire superseded it in the mid to late 1920s). Therefore, when we see a theremin that was clearly built in the 1930s, but with green wire coils, chances are that it's a Lev-built or Teletouch. It's worth noting that a Teletouch theremin survives that was made a few months after Theremin's departure from the U.S., and it does not use green silk insulated wire for the main coils. Another common trait of Lev-built instruments is that they typically had the tall resonance coils (and sometimes others) protected by a close-fitting, transparent celluloid sleeve. This was done most likely to offer some physical protection to the extremely delicate wire windings, which in some cases were nearly as thin as human hair (Comparison based on AWG 38 wire). The pitch resonance control coil alone was comprised of more than a thousand turns of this fine wire. These protective sleeves could also reduce the effects of atmospheric conditions. Both temperature and humidity can interfere with the stability and operating characteristics of oscillators. Fabric insulation can more readily absorb moisture than most other types of wire coverings. Whether for physical protection or atmospheric isolation, Lev preferred to protect his coils in this way. At least one ca. 1937–38 Teletouch era theremin survives that has green insulated windings with no protective sleeves. It's possible that the sleeves were damaged and removed at some point in the long history of this instrument, assuming it had them to begin with. Playing Lucie Bigelow Rosen's September theremin was like trying to play a rhinoceros! Sometimes the things you think of as tools let you know that until you're good friends, they'll insist on being collaborators. (Thereminist Rob Schwimmer's comment on the brute power of this instrument, combined with its extremely sensitive space-control interface). Lucie's September theremin contains the most radical audio amplifier of any known Lev-built instrument, has a greater than average octave range and Theremin's most advanced volume control circuit. These traits, when compared to an RCA Theremin—more audio power, extended pitch range and more responsive volume control, are common to a greater or lesser degree on most of the known surviving Lev-built theremins. Even the earliest known U.S. Lev-built theremin has a faster volume circuit than the nearly contemporary Lev-engineered RCA. In short, Lev's custom instruments were designed and tuned to exceed the performance of their factory-made counterparts.